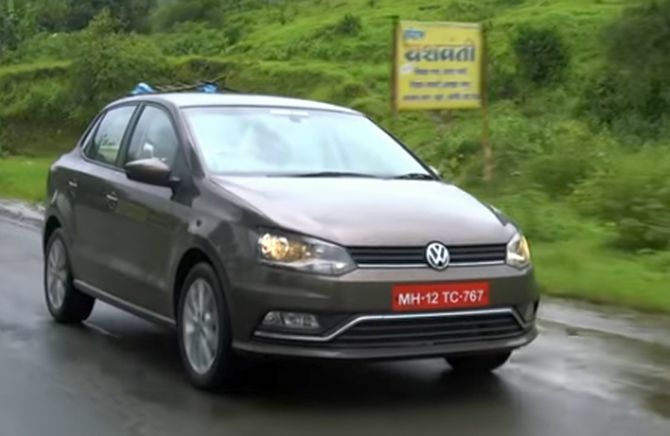 Rediff.com » Business » Should you buy the new Volkswagen Ameo 1.0 petrol? 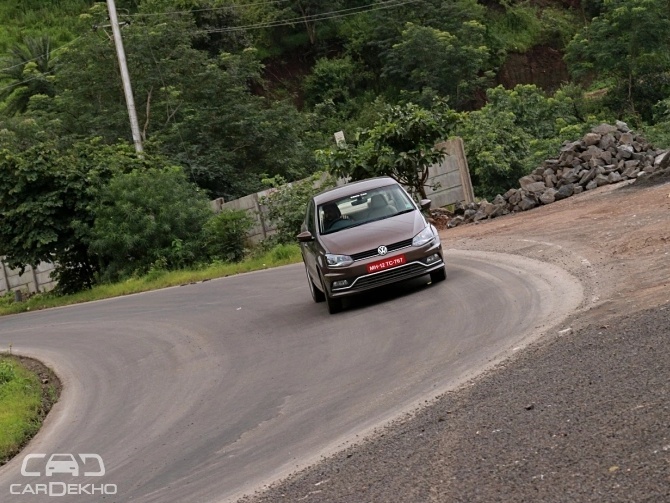 Should you buy the new Volkswagen Ameo 1.0 petrol? 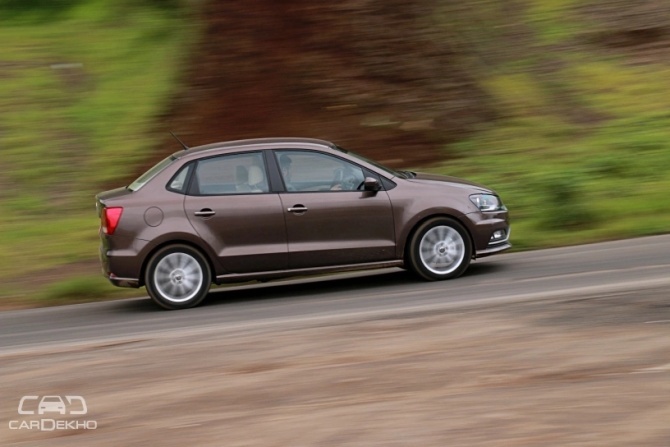 The new Volkswagen Ameo 1.0 Petrol does not sport any racy looking set of stickers or a new set of features. The update is actually under the bonnet -- a brand new engine. But does it drastically change anything? Volkswagen's first sub-4 metre sedan (ever) was met with a lukewarm response over the two years it's been on sale in India. The manufacturer has responded by giving the Ameo a significant update. No, we aren't talking about a racy looking set of stickers or a new set of features even. Is it any better than the old 1.2? Should it be on your consideration list? The EA111 1.2-litre, three-cylinder engine has been discontinued. In its place is the EA211 series 1.0-litre engine. The displacement has gone down, and so has the torque output -- by a substantial 15Nm at that. Peak power, though, is marginally higher by 2PS. On paper then, the engine doesn't seem all that promising. Does it redeem itself out in the real world? The answer to that question is, yes. 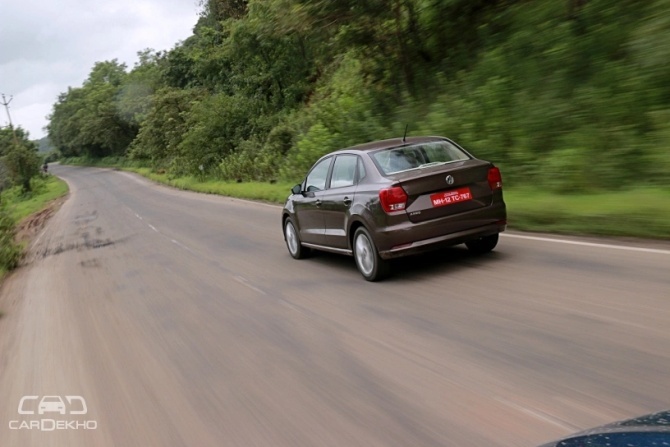 In spite of what the numbers suggest, the Ameo 1.0 is quite an easy car to drive. Power delivery rises smoothly as you press down on the accelerator. Expectedly, there's no sudden spike in power (even if you slam the A-pedal into the mat) as the engine builds revs. Clearly then, this petrol engine is not meant to be, or likes to be, driven hard. For reference, even the Kwid 1.0 was substantially quicker to 100kmph compared to this compact sedan. As you can see, the roll-on acceleration isn't particularly brisk either. What belies the on-paper numbers is the motor's sheer pulling power from lower revs. The engine never feels strained even if you're at the edge of lugging it (25kmph in 5th, for example). Step on the gas at this point and the motor makes slow, but steady progress. This means you're saved from the hassle of downshifting every now and then if you spot a speed breaker, or a batch of slow moving traffic. You can simply leave it in 2nd or 3rd, and comfortably chug around town. What makes the process easier, is the fact that the controls are super light. 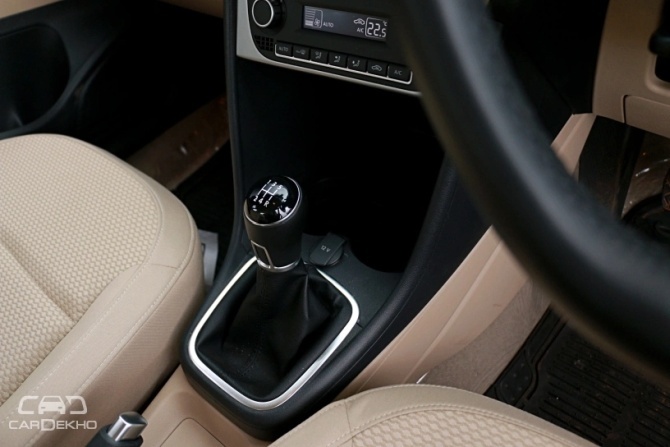 Be it the steering, clutch or the gear lever. Even if you are stuck in a bad traffic, you wouldn't be cursing your stars. If we could nitpick a bit, we feel the travel on the clutch pedal was a bit too long. Also, the resting point of the clutch lever felt higher than required, which meant our knees pointed upwards every time we went for the clutch pedal. That said, it's quite easy to get used to both these traits of the Ameo. What we're also very happy to get used to, is the fuel efficiency. When driven calmly, we managed to eke out 13.92kmpl, in the city. The credit for this number partly goes to the slick 5-speed gearbox. With super-tall ratios, it wants to save every little drop of fuel you put into the car. Out on the highway too, we got a respectable 19.02kmpl from the three-pot engine. Speaking of highways, the Ameo 1.0 is happy to climb up to 80/100kmph and has no issues maintaining that speed either. Make no mistake, this tiny engine can chug along at these speeds all day long. If cruising comfortably in the third lane is your jam, then the engine won't give you a reason to complain. The only hiccup here is when you absolutely HAVE to overtake quickly. Stomping on the throttle gives you practically no acceleration. So, you will have to drop a gear or maybe even two, to get yourself going at a swift pace. The same holds true on inclines as well, where you need to go heavy on the gas in the lower gears to ensure you make it to the top. With a full load, the petrol motor will struggle a bit around the twisties. Compared to the old 1.2-litre motor, this one feels a tad bit easier to drive, especially inside the city. Where you would find yourself working the gearbox with the older motor, you'd find yourself pulling through in the same gear in this one. That's the wider torque band making its presence felt. In two key ways, though, it isn't much different. First, the vibrations. Although well controlled, they haven't been toned down significantly. So, you still feel it through the pedals, the steering and the floor. Second, the fun-to-drive factor. If you want giggles, pick the one with the TDI badge. Simple. 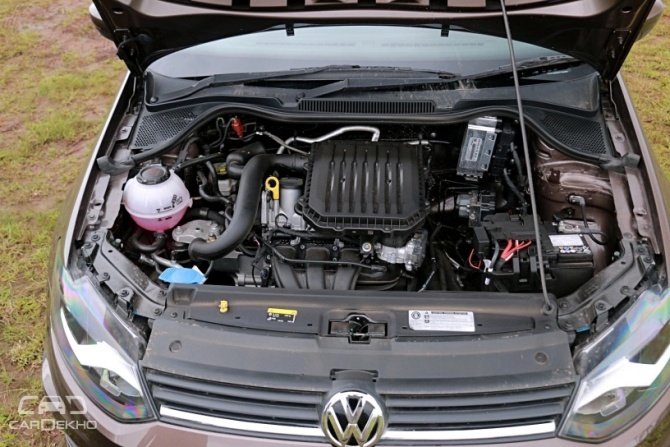 Save for the new engine, the Ameo feels pretty much identical to drive around. The suspension continues to be slightly stiff, that will cause some side-to-side rocking over sharp bumps at low speeds. As speeds climb, though, you'd begin to appreciate the setup as it manages to negate vertical bobbing almost entirely. The steering too weighs up enough as speeds climb, giving you enough confidence to maintain triple-digit speeds. Not that you would, but a round of cornering will leave you wanting more from the steering. It also feels slightly quicker to turn into bends compared to the diesel, but this isn't something that will make difference to your everyday drives. Coming back to the heart of the matter -- the new engine. Yes, it doesn't have the smoothness of a four-cylinder that Maruti, Honda and Hyundai offer, but it's just as drivable and just as efficient. And that more than makes up for the missing cylinder. The highlights, including safety, solid build quality, and the bucketload of features are just the same as before. Naturally, the shortcomings remain too -- the space on offer both in the rear bench and the boot isn't great, and the stiff ride takes getting used to. In case you're looking out for a petrol sedan primarily for city use, the Ameo does deserve a spot on your consideration list. While it may not be the default choice for anyone shopping in this price bracket, it definitely is a no-nonsense package that gets the basics of commuting right. CarDekho.com offers the best platform in India to research cars online. Make better car buying decisions using features like car research, reviews, car comparisons, discounts, on-road prices etc on CarDekho.com.